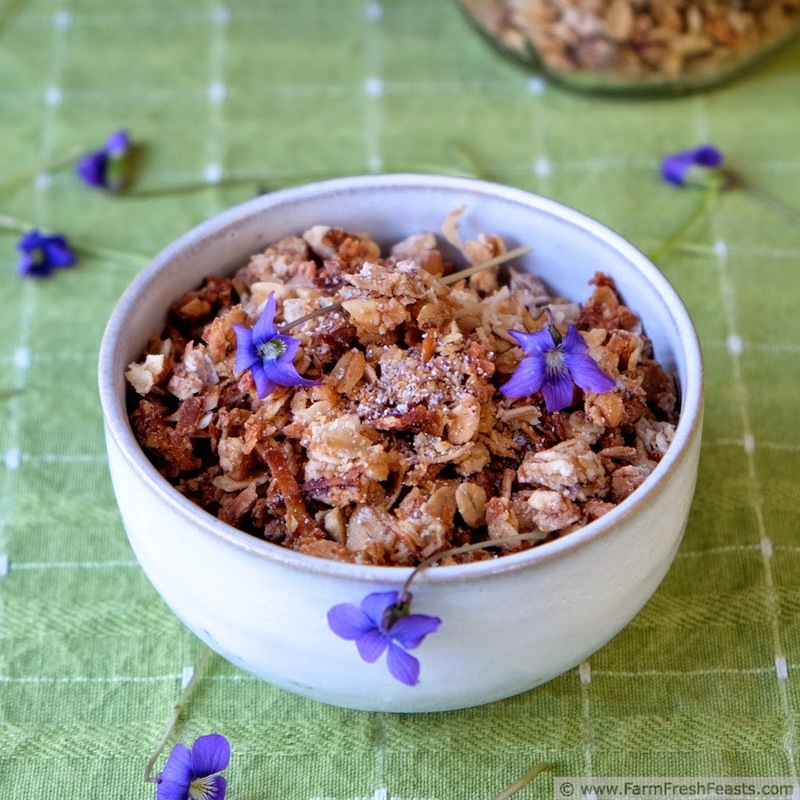 Nutty crunchy granola, sweetened with wild violet sugar and wild violet syrup, is a tasty breakfast or bedtime snack. The mothering/mentoring part is just bonus. Mentors are a lot like Mothers. Both mentors and mothers nurture their protégées. They provide support--practical, physical, and emotional support. They want to see their charges succeed. Mentors gently correct mistakes and provide honest feedback. Mothers do as well [even if it exasperates us to provide the same feed back again and again]. While I don't think I am exactly friends with my own children, I do consider my mentors to be my friends. Granola and kefir? I got into that tasty combination after spending a lovely weekend with my mom and her college buddies and their daughters. The weekend was hosted by my friend and mentor Alanna, and I hope we honored her mom's memory. We sure did it up right. My own mom continues to be an excellent mentor. My attitude towards leftovers I learned from her. Not being afraid of canning the summer harvest? Learned at my mom's shoulder. Now she's showing me how to age gracefully. Watching my folks pro-actively move to a more supported living arrangement is something I've observed since they moved out of the big suburban house into a city condo the summer I graduated from high school. What do these three women have to do with the recipe I'm sharing today? Let me braid the strands together. Meghan got me interested in making homemade granola. My mom taught me to use what I had on hand to create new meals. Alanna has been mentoring my blogging since I first emailed her saying 'I'm thinking of starting a CSA blog' . . . later she told me about the 30 Days to Better Food Photography course I finished a year ago which has helped me improve my images. We eat first with our eyes, if we are fortunate enough to see, and since I can't have you reach through the screen to sample this granola the least I can do is make it look appealing. For other recipes using wild violets, please see my Wild Violet Recipes Collection. It's a part of the Visual Recipe Index by Ingredient, a resource for folks like me eating from the front yard, the farm share, the farmer's market, the garden, the neighbor's garden, and great deals on ugly produce at the grocery store. Note: I store my granola in canning jars, using these lids (Amazon affiliate link). I bought mine in the bashed area of the commissary in Hawaii [not having a clue what to use them for but being unable to resist the lure of a mark down sticker]. I haven't seen them in grocery store canning supply areas lately, but I have found them in small hardware stores' canning supply areas. I started using them in Virginia with freezer jam, and here in Ohio they cap jars of stock, cider, green tomato bacon jam and fresh tomato pesto in the freezer as well as opened jars of canned salsa and jam in the fridge. This recipe makes enough for a 1 quart jar and a ½ pint jar plus a bowl to eat right away (or 1 quart plus 1 pint if you're not peckish). 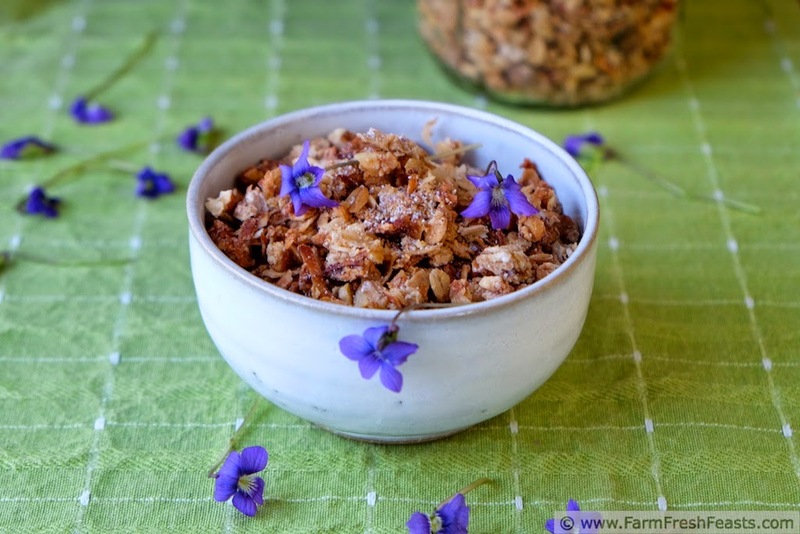 In a large wide bowl, combine oats, nuts, flax seed, 2 Tablespoons wild violet sugar and coconut until well mixed. Pour oil over mixture, and stir to combine the oil throughout. Pour syrup over mixture and stir until thoroughly mixed. Dump onto a rimmed baking sheet, and spread out to a smooth layer. Bake for 25-30 minutes, stirring every 10 minutes, until edges are toasted. Sprinkle remaining 2 Tablespoons wild violet sugar over the baking sheet. Let cool. Note: Since I've become a homemade granola fan, I've been trying out different flavor combinations. I like sweet granola, probably because I eat it with sour kefir, and when my jug of Ohio maple syrup is nearly empty--and the bottom is covered with maple sugar crystals [not unlike the bottom of our hot water heater was until we my spouse flushed the hard water deposits out over the weekend] the result is tiny bursts of sweet maple flavor with each bowl. 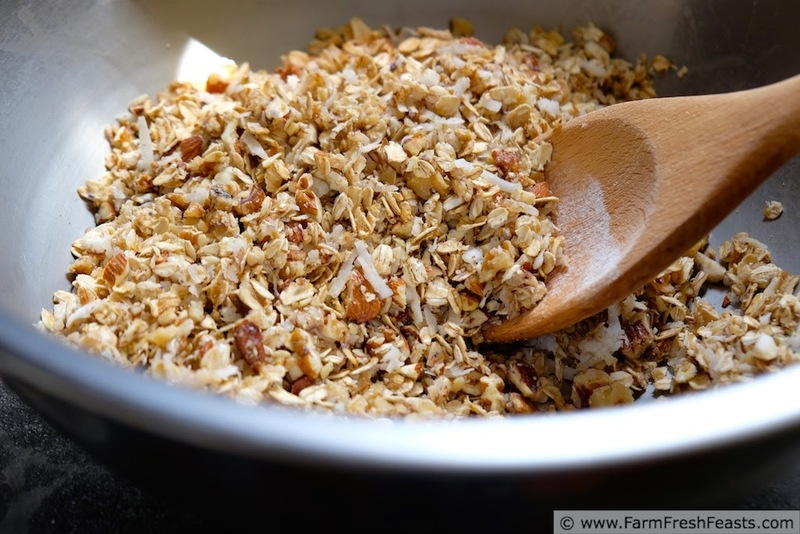 I really recommend using the bottom of the maple syrup jug to make granola. I'm trying failing to show you the little pieces of violet petals, but trust me they are there. Ah shucks. I'm pretty sure I'm blushing. It's funny or ironic since I consider you my mentor (along with being my friend, of course). You inspired me to get a deep freezer and start stockpiling my CSA produce. Hell your knowledge basically helped feed my family this past winter. You also helped get me through a very long winter without a Hubby and for that I will be forever grateful. I welcome your opinions, your gentle corrections and your subtle suggestions always. I can always learn something. Like how to make wild violet syrup. I do see the pretty purple petals mixed in. They're beautiful, and I will definitely need to find some so I can try this granola. 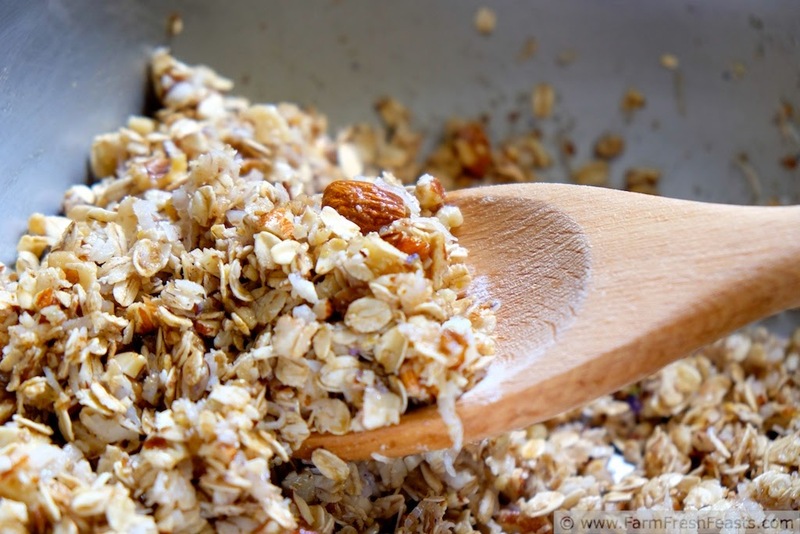 Granola with Kefir is totally from Karen's Family Style Food combinations. Thank you, my friend! It's fun, and simple, to make both wild violet sugar and syrup. Just don't have your daughter pick violets and then forget about them for a week . . . or two . . . because you need to wash them fresh and use them pretty quickly. Ahem, not that this has ever happened to me . . .
Good thing there are still violets blooming! 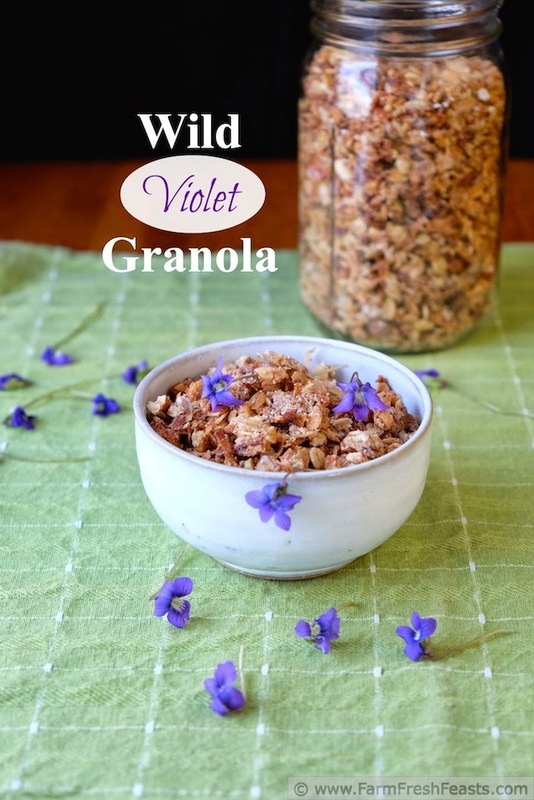 I love the sound of this granola but have never prepared anything with violet sugar or syrup. Can't wait to try my hand at making this and seeing what violets taste like. Love that fact that it is gluten free too! Thanks for sharing on Simple Supper Tuesday. This is a simple, and fun, recipe to make. What a neat recipe. I've never cooked/baked with edible flowers before. Thank you for sharing with us at Simple Supper Tuesday. One year I had such great plans to have nasturtiums in the garden, but the varmints were decidedly NOT ON BOARD with my plans. I've since decided to forage for my edible flowers. It works out better.